A new work has been released from the pochette of "TOKYO BOPPER" that combines design and functionality! Flower motif that is placed well ! It's not just cute, it creates an elegant and mode feeling. 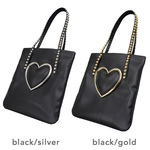 There is large pocket on the back of the bag and designed it conveniently. And a gusset is wide you wouldn't guess from their looks. They are functional and fashionable enough to make you satisfied. The belt is the original buckle with weak gloss and the length is adjustable.You can carry it in all seasons and all coordinates. When you open up a flap, there is a pocket without gusset at the front side. This will satisfy your such requirements. The front side is matte texture with surface change. A high-class feeling and mode feeling promote your fashion nice. Even if it uses every day, weariness does not come! It does not choose any style ! It was waiting for such an exactly good bag like those! Why don’t you try new bags from TOKYO BOPPER ! 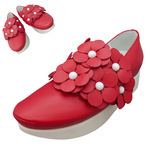 ※Unlike a synthetic leather, this material is good for the durability.